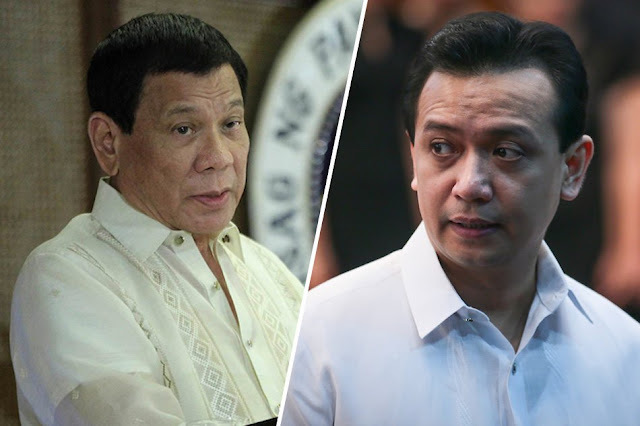 Sen. Antonio Trillanes IV elevated his legal battle with President Rodrigo Duterte’s Proclamation 572 to the Supreme Court and LOST. SC junks Trillanes' TRO plea vs Duterte proclamation. 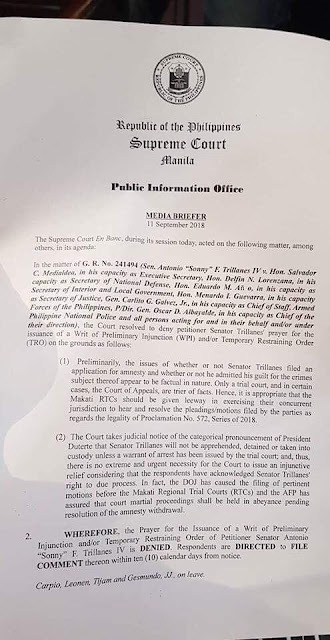 Sen. Antonio Trillanes IV failed to secure relief from the Supreme Court as the tribunal denied his petition for halt order against Proclamation 572. SC spokesperson Maria Victoria Gleoresty Guerra said that the SC, in a full court session, ruled to deny Trillanes’ prayer to TRO. “Only a trial court and in certain cases, the Court of Appeals, are trier of facts,” the SC PIO added. The SC ordered the respondents to comment on Trillanes’ petition in 10 days. Trillanes, on September 6, elevated his legal battle with President Rodrigo Duterte’s Proclamation 572 to the highest court of the land. He asked for a temporary restraining order to stop the members of the Armed Forces of the Philippines and the Philippine National police from arresting him. Robles said: “I believe that the justices of the Supreme Court and the judges in the trial court would act if they see this abuse and assault our Constitution and defend our rights. The Department of Justice, last week, filed motions to the issuance of arrest warrant and travel ban before two separate trial courts in Makati. Two hearings have been set on the Trillanes’ cases over Magdalo immunities. Makati Regional Trial Court Branch 148 will hold a hearing on September 13 over the coup d’etat case over 2003 Oakwood Mutiny, while Branch 150 will hear the rebellion case over the 2007 Manila Peninsula siege on September 14. The Palace said last week that Duterte will wait for the rulings of the local trial courts if a warrant will be issued against Trillanes. Supreme Court denies the plea of Sen. Antonio Trillanes IV requesting for a temporary restraining order on Pres. Rodrigo Duterte's proclamation voiding his amnesty.